Stilettos Diary: Metallic Mayhem - My Qvendo Outfit. Firstly thank you so much Qvendo.com for this outfit. It was love at first sight. The silhouette is so soft, comfortable and as light as a feather. Qvendo.com not only offers amazing brands at affordable price to the Indian Market ,the quality of service and speedy delivery sets them apart from rest of the online website. I decided to go with a Metallic outlook for this outfit. 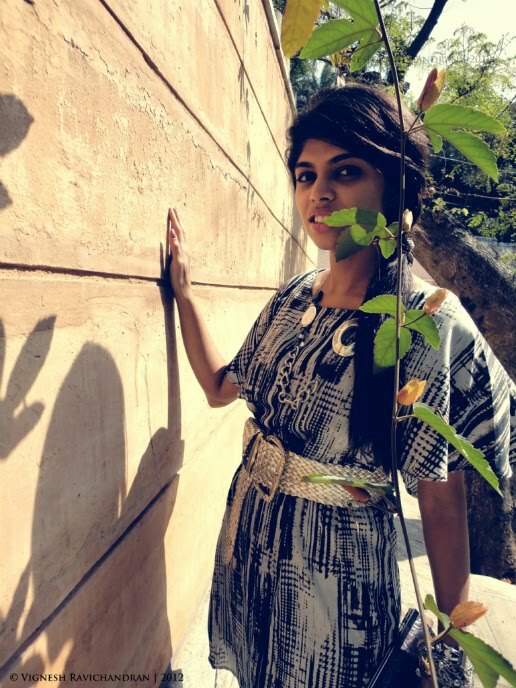 I teamed up the dress with metallic belt from Lifestyle for 150 Rs( during their 50% sale). The metallic accessories(both are chains, one I transformed into a bracelet) and Metallic peep toe heels are old as seen in Black, white and metallic me, A furry affair. 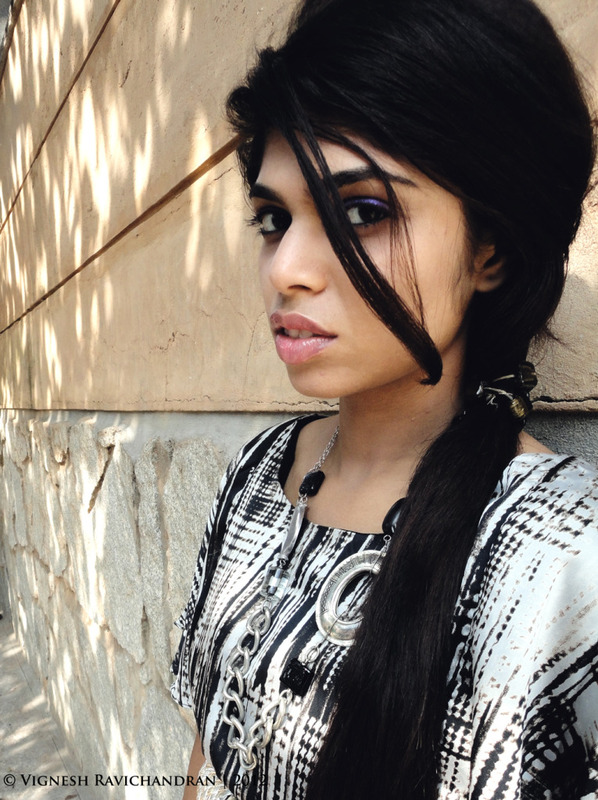 The metallic accessories are from yebhi.com. The peep toe heels are from Catwalk bought during 50% sale. The heels cost me 800Rs and accessories around 450Rs. To brighten up the outfit I added faux croc purple leather wallet( borrowed from my mom)and bright makeup from M.A.C cosmetics(Suddenly my new found obsession is purple color) . I used their Metallic purple eyeliner and added Metallic purple pigments. The lip gloss is from Revlon. Let me know what you think about my new outfit and purple touch to the outfit. I will be waiting for all your lovely comments. Last 4 days of Oasap Giveaway. Please do participate. Really awesome! I think its your best so far! Hi Megha!! Tks for visit me at my blog, Correria de Mulher! I'm Jéssica from Brazil, and love your outfit! Great post and blog! i know!! the dress is so soft and its as light as a feather!! totally in love with the dress. That dress is beautiful! I'd love to have one that looks like that one! ine just drop an email to qvendo team. they will definitely help you. trust me the dress is absolutely amazing. wow, you are so pretty!!!! I like your hair here!! U look absolutely stunning in all the pix! Loved the bright pink lips...Revlon which shade? We follow you now! We love to hear that someone from India have visited our blog! :) You have an amazing style, love the clutch :)! love your photos and your blog is very very nice! thank you for your lovely comment...you blog is great...i'm following...hope you keep in touch too!!! Wauw I love this outfit! wow love this dress and also the shoes! like it! You look fab! Love the dress! Great picture of you. I love your dress. My favourite item in the giveaway post is the satchel. i love this...you are gorgeous by the way! You are a stunner! Love the eye liner matching the clutch! The dress is amazing too! meeeeg :0)i feel this one is the best so far :) love your outfit,make up,hairstyle...basically everything :) :) great going ya girl:)hugs! OMG ! you are so so cute ! love the look !! can u tell me with gloss or lipstick did u use ? thats awesome !! This look is perfect for you. Thanks so much for stopping by my blog and congratulations on the featured interview. Beautiful dress -you look stunning! This is a great dress and it flatters you a lot. The print really makes this a beautiful piece and it can be worn for day wear and evening wear. I love pieces like this that have so much versatility. Love your bracelets too. This is a beautiful dress. It's versatile that can be worn casual or evening attire. I like how you accessorized because its not too much and makes a great statement. Love it. the dress is definitely nice..and u look very chic!!! Vignesh! The first photograph is my favorite one of Megha.. great job! 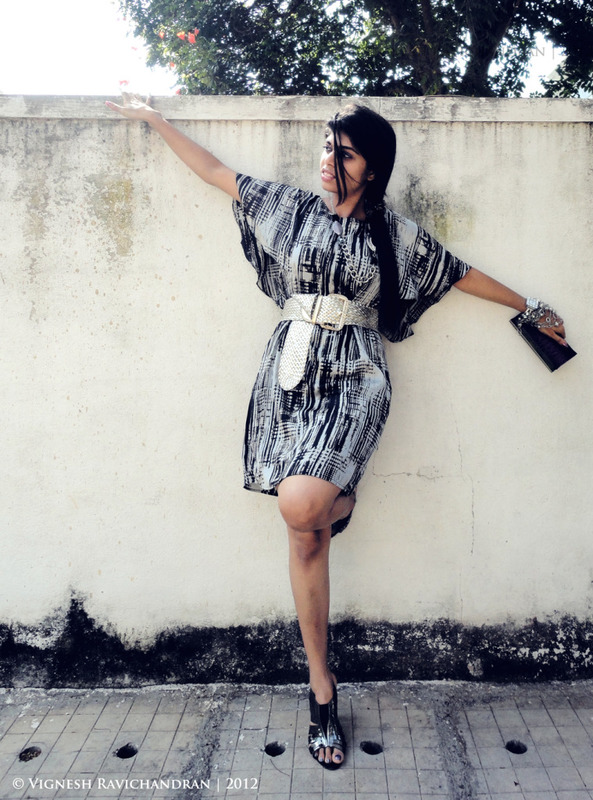 i love the dress and your blog !